The drill press was designed originally for the metalworking trades. However, with the availability of cutting tools, jigs and attachments, the drill press is now one of the most versatile tools in the shop. It not only drills into metal, but also bores into wood and performs other woodworking operations such as mortising and sanding. In fact, after the table saw, the drill press is easily the second most important piece of equipment in the average home workshop. The conventional drill press consists of these main parts: the base, column, table and head. The base supports the machine. Usually, it has pre-drilled holes for fastening the drill press to the floor or to a stand or bench. The column, generally made of steel, holds the table and head and is fastened to the base. Actually, the length of this hollow column determines whether the drill press is a bench model or a floor model. Floor models range in height from 66 to 75 in. ; bench models range from 23 to 48 inches. The table is clamped to the column and can be moved to any point between the head and the base. The table may have slots in it to aid in clamping holding fixtures or workpieces. It usually also has a central hole through it. Some tables can be tilted to any angle, right or left, while other models have a fixed position only. An auxiliary table made of plywood or particleboard, which can be readily fastened to the regular drill press table, is available on some models, or it can be custom made in the shop. The term head is used to designate the entire working mechanism attached to the upper part of the column. The essential part of the head is the spindle. This revolves in a vertical position and is housed in bearings at either end of a movable sleeve, called the quill. The quill, and hence the spindle which it carries, is moved downward by means of a simple rack-and-pinion gearing, worked by the feed lever. When the feed handle is released, the quill is returned to its normal up position by means of a spring. Adjustments are provided for locking the quill and presetting the depth to which the quill can travel. Incidentally, the quill usually has a stroke or travel of from 2 to 3-1/4 in. in most home workshop models. The typical drill press has a 1/2 in. capacity geared chuck with a key. This chuck offers the best grip for most work. Most drill press accessories fit directly into the geared chuck. The spindle usually is driven by a stepped-cone pulley or pulleys connected by a V-belt to a similar pulley on the motor. The motor usually is bolted to a plate on the head casting in the rear of the column. The average range of speeds is from 250 to about 3,000 revolutions per minute (rpm). Because the motor shaft stands vertically, a sealed ball-bearing motor should be used as a power unit. For average work, a 1/4 or 3/4 horsepower motor meets most needs. The capacity or size of the drill press is determined by the distance from the center of the chuck to the front of the column. This distance is expressed as a diameter. For example, a 16-1/2 in. drill press will drill a hole through the center of a round piece of stock that is 16-1/2 in. in diameter. The actual distance from the center of the chuck to the front of the column is 8-1/4 inches. Conventional drill press sizes for home workshops generally range from 8 to 17 inches. The entire drill press should be solidly constructed to allow for long life and prolonged precision work. The table should be ground flat for accurate work, and the base should also have a flat surface for holding large workpieces. The table should be easily adjusted up or down, left or right, for adapting to different drilling situations. The head should be cast iron, which offers excellent support and protection for the most important parts of the drill press -- the motor, quill and pinion shaft. 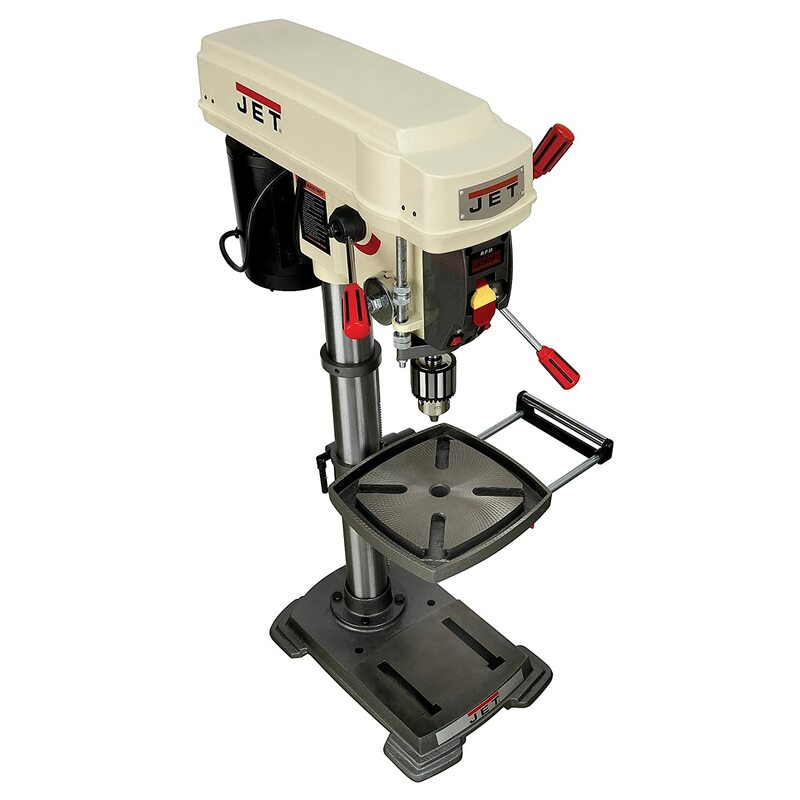 The drill press should be equipped with a chuck that is tightened by a wrench or key rather than by hand. The chuck should have a 1/2 in. capacity so it will accommodate bits of various sizes and accessories. Many drills feature a taper-mounted chuck. By having a taper-mounted chuck, the run-out is practically eliminated and the user is assured of accurate drilling. Some chucks feature a self-ejecting key, which insures that the key is not left in the chuck accidentally. The depth-adjustment gauge allows the user to drill many holes at the same depth as the original hole. It eliminates any guesswork and allows precise, accurate drilling. The drill press should have an adjustable motor bracket support that is sturdily constructed to support the motor, yet is easily movable to as-sure proper belt tension. The drill press should have a selection of speeds for drilling wood, metal, plastic, glass and ceramics. Some drills feature a triple pulley arrangement for easy selection of 12 different speeds, ranging from a low of 250 rpm to a high of 3,000 rpm. Be certain you can get proper replacement parts and service if needed. A complete line of accessories will help you get the most from your machine. Accessories available from the manufacturer of the tool that you buy are designed for your particular tool. This eliminates having to use makeshift arrangements in order to use your tool to its best advantage. It pays to equip your workshop with the best in power tools. Choose a drill press produced by a manufacturer who has established a record of quality and reliability.